Bribery and corruption can be regarded as a malicious cancer that has penetrated into almost every strata of Sri Lankan state. It can be considered a major factor affecting Sri Lanka’s poverty, backwardness and indebtedness. Abuse of power by those who rule the country to accumulate wealth illegally and dishonestly for their personal gains has become a “permanent feature” in the rule of Sri Lanka from 1977 to the present. And for this reason alone, elimination of bribery and corruption should be made an important and prime goal in making a new constitution. The politicians or the elected representatives of the people who steer State rule are the main source of corruption. Therefore, in making a new constitution, more powers should be given to the people rather than leaving it solely to politicians themselves. The reason why the people should be more involved and given prominence in this exercise is not only because it is an accepted norm in the modern day constitution making to give more powers to people but, because it is most unlikely that all necessary provisions required for complete eradication of corruption will be incorporated in the constitution if the task is left only to the representatives of the Legislature, the main source of corruption. Surely, one can not expect a genuine interest in eradicating bribery and corruption from the representatives of the Legislature who thrive on corruption and considered to be the source of the problem except from the people themselves who are the helpless victims of widespread corruption. Even though the general public may have a genuine interest in eradicating bribery and corruption, one might probably question as to whether they possess the knowledge and experience required to participate in a meaningful manner in an onerous exercise like making a constitution. There is an element of truth in this question. Considering this fact, measures are taken to include awareness programmes in the agenda of making a constitution to equip the general public with the knowledge on the subject. Consequently, constitution making will turn out to be a process that endows the public with the knowledge and discipline thereby, in the final analysis, making them good constitution makers. a) A system must be established for all chief office bearers to take an oath in accordance with the nature of their responsibilities rather than one common oath for everyone. The oath should specifically state that they are bound to fulfil their responsibility in accordance with the Constitution and the law of the country and the breach of it constitutes a punishable offence. a) A clear and formal interpretation that briefly describes the duties and responsibilities of the Head of the state and those of the Prime Minister and the Cabinet of Ministers in the event that the Prime Minister is the Head of the state should be included in the Constitution. b) Deliberate violation of the constitution ought to be made a serious offence punishable by law with the punishment to be imposed being clearly stated in the constitution itself. Also, the provisions of immunity from both civil and criminal proceedings granted to the Head of the state in case of violation of the constitution should be removed. (c) Provisions must be made enabling the public to take legal action against the offenders who violate the constitution, without having to incur heavy expenses. The Head of State is a temporary, but the main custodian of the public property in Sri Lanka. This includes the subject of radio waves and frequencies as well. The power to sell, lease or grant any public property also lies in him. In this field, all Heads of State of Sri Lanka had followed a policy of abusing their discretion by selling public property at a nominal price or at times, granting them to their cronies free of charge causing a massive loss to the state. a) The discretionary power vested in the Head of State to sell, lease or grant public property should be abolished.There should be a proper interpretation and explanation on how the power of the Head of State in this regard can be utilised. b) It should be made a mandatory requirement that the public is made known before any action taken in regard to sale, lease or grant public property is taken. Besides that, obtaining approval of the Legislature and the Judiciary should also be made a necessary condition. It is also necessary that the provisions should be made to strengthen the right of the public to intervene in such cases of public importance. Upto 1977, the Parliamentarians weren’t allowed to do business with the Government. The MPs who had conducted business were deprived of their parliamentary seats. This can be considered a legal tradition being practised in all countries where there is a democratic system of government. 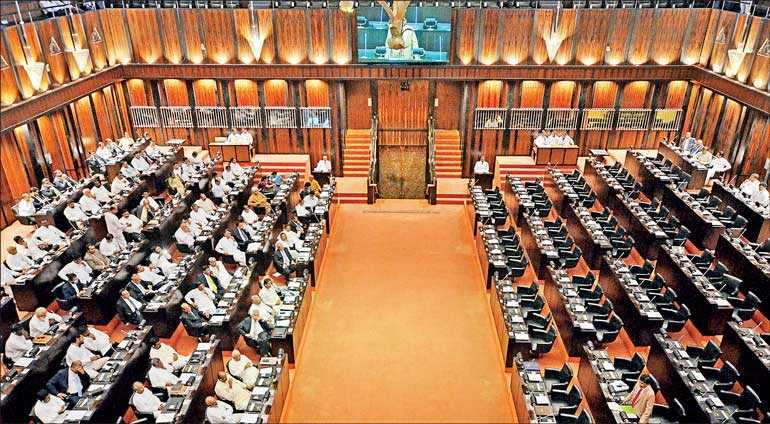 Even though, President Jayewardene did not abolish the law pertains to this, he allowed the MPs to pursue business with the Government ignoring the prevailing tradition and rendering the law virtually inoperative. His successors too, pursued the tradition set by JR which was anti-democratic, ugly and illegal. As a result, a good number of MPs of the Legislature became business dealers transacting business with the Government. Some of them have become planters having bought Government lands at a nominal price. Some others have become Government contractors. Several others had become Government licensed dealers of timber, rubble, sand and liquor. This system has invariably rendered politics an easy way of becoming rich through illegal means. This scenario has resulted in stripping them of the true character of their public representation and made them a lot that appears for amassing wealth for their own sake through undue and unjustifiable means. While investigating into the dealings of MPs who had engaged in business transactions with the Government ignoring the established laws that prohibit such practices, it is important that the Judiciary is granted the discretionary powers to decide on the policy to be followed in regard to such practices. a) Prohibit the MPs elected by the people, transacting business with the Government and restore the old system that deprived the parliamentary seats of those committing such offences by the constitution itself. b) There is no other democratic country in the world other than Sri Lanka in which duty free permits are offered to MPs for import of vehicles and a substantial fuel allowance for their vehicles.Provisions should be incorporated in the constitution prohibiting this unjust and wasteful practice. c) The system of allocating funds to the MPs from decentralisation budget is also a wasteful system which is contrary to the parliamentary tradition. It is also a non-productive system that adds an unnecessary burden on the budget. Provisions should be incorporated in the constitution prohibiting this wasteful practice. The number of staff attached to the Presidential Secretariat during the tenure of President Jayewardene remained at less than 25. The size of the vehicle pool also was comparatively small. He did not have any advisors. But, today there is over 1,000 staff serving at the Presidential Secretariat. The number of staff in the Prime Minister’s Office is equally high and remains above a thousand. The number of advisers to President is also as high as in the hundreds. It is very rare that the Presidents seek their advice. But, they receive salaries or allowances without even reporting for work. They are provided with official vehicles and fuel as well. a) The size of the staff and the number of vehicles to be allocated to the Head of State should be determined after making a formal and systematic appraisal and assessment of the actual requirements. Accordingly, the number of staff and the number of vehicles decided this way should be allocated to the office of the Head of State i.e. to the executive president if the executive presidential system is maintained or to the prime minister, if the presidential system is abolished and a parliamentary system of government is introduced. b) Personal staff system of the Head of State and the members of the Cabinet should be abolished. It can be considered an ugly and corrupt system maintained to provide salaries and privileges to their family members incurring a heavy cost burden to the Government. c) The system of providing official residence and a team of staff to the Heads of State going on retirement and to their spouses at the cost of the Government should also be revoked.This system has resulted in those having good houses renting them at a high price and abusing the right to have an official residence and a team of staff. This system must be changed and a mechanism should be introduced to offer an appropriate house when a poor person retires as the Head of state, only when he or she does not have a proper house. d) A proper policy should be adopted in determining the type and the extent of security coverage granted to the high ranking politicians and also minimising the huge and wasteful costs involved in such endeavours. e) The amounts spent on purchase of high cost luxury vehicles for high-ranking officers in Sri Lanka are enormously high. In a political sense, it can be considered an utterly wasteful expense incurred for ostentation which cannot be seen in practice in any other civilised country. The market value of a vehicle given to super grade officials of the Government is over Rs. 200 lakhs. The fuel consumption of such a vehicle can be less than seven kilometres per litre. The price of a vehicle used by top-end political leaders is said to be over Rs. 1,000 lakhs. The greed for travelling in high-end luxury vehicles seems to have become a kind of insanity. It is necessary to adopt a new policy to end this disgusting system that has become a heavy financial burden to the country. a) A system of impeachment had been introduced by the present constitution to remove a President from office on account of misconduct, abuse or violation of public trust. But it can be considered a discursive system that will not pave the way for reaching a logical conclusion. If the presidential system is going to be maintained, the system of impeachment should be amended so that it would be practically possible to remove a president on account of misconduct and violation of public trust. b) Provision must be made to enable people to present an impeachment or a no confidence motion to the Legislature using the systems of “popular sovereignty”, a system being used in Switzerland, against any high-ranking officer who commits serious offences. c) It is also important that a system is introduced enabling even a single person to initiate an impeachment or a no confidence motion against any corrupt high-ranking officer provided the complainant has adequate evidence to support the charge. The Auditor General can be empowered to receive such complaints and inquire into them. The Auditor General can be entrusted with the authority to establish a special unit and pursue the inquiries. While this unit should come under the scrutiny of the public as well as the Legislature, if the allegations are proved after a formal inquiry and the accused is to be removed from office by an impeachment, an impeachment motion against him must be presented to the Legislature by this unit. If the accused is to be removed by a no confidence motion, the right to present a no confidence motion to the Legislature can be entrusted to the Auditor General. Provisions can be introduced to the constitution stipulating that the inquiry report of the Auditor General General with his recommendations is entered in the agenda of the Parliament when it was handed over to the Secretary General of Parliament so that it can be debated and subjected to vote. It is possible that an opportunity is given to the Auditor General to present the case at the outset of the debate, with an analytical description on how the inquiry was conducted together with its findings whilst at the same time giving an opportunity to the accused officer to defend himself. However, if the removal of an accused officer who is found guilty of an offence consequent to a formal investigation does not require an impeachment motion or a no-confidence motion, necessary provisions should be made so that the report of the Auditor General is sent to the head of the relevant ministry for necessary action with the latter being empowered with the authority to remove the convict officer from service. d) The Declaration of Assets and Liabilities Act No.1 of 1975 amended by Act No 74 of 1988 can be considered a very powerful law enacted giving general public the power to identify the public officers who had earned assets by undue means and get their assistance in imposing the law against such officers. According to this law, the people have the right to obtain copies of the declaration made by any person who is bound by this law to declare assets and liabilities. The relevant authority without raising any question, should issue the copies of the declaration of assets and liabilities to any applicant who ask for them after paying the required fee for it. Until 1988, the right of the people to obtain declaration of assets and liabilities had been prevented. I was the first person to have this door opened for the people. I played a pioneering role in bringing this issue into the forefront. So, I can claim with some authority to have both the theoretical knowledge and the practical understanding of this subject. It would be possible to make a revolutionary change in the field of bribery and corruption involving public officers simply by removing the weaknesses in this law and making it stronger by updating it. It can generate a great fear in the people who accumulate wealth abusing their official position and create an atmosphere that someday they could get trapped by the law. It must be mentioned here that this important law has been rendered weak by two judgments given by the Right to Information Commission. The following are the reforms needed to be made to make this law stronger and a powerful law. e) The form to be filled by the declarant of assets and liabilities should be updated to suit the present day requirements. According to this law, a person who has committed an offense in this regard is liable to a punishment that is limited to a maximum fine of Rs. 1,000 or one-year imprisonment. The minimum fine should be increased to Rs. 5 lakhs and it should be increased in proportion to the amount of wealth earned on undue means. The minimum term of imprisonment should be increased to three years. It should be made compulsory that the wrongdoers are imprisoned in addition to the payment of a fine.The public should be allowed the opportunity to examine the declarations free of charge by creating a separate website exclusively for declarations of assets and liabilities and introducing a computer generated application form to be filled by them. By this reformation alone, it would be possible to trap all public officers who had earned assets abusing their official status and power. Simultaneously, it will make public officers realise the seriousness of this wrong and unethical habit and the need for refraining from it. That alone will make a big change in this sphere. e) The Commission to Investigate Allegations of Bribery or Corruption should be amended following the Independent Commission against Corruption of Hong Kong as a model. Similarly, the Commission to Investigate Allegations of Bribery or Corruption, Act No 19 of 1994 too, should be amended to suit that. With that the structure of the commission, the manner in which the commissioners are appointed, the nature of the commissioners appointed, the way the investigators are appointed and the way the investigations held, all will be changed. At one time, Hong Kong had been a city where institutionalised corruption had penetrated every strata of the society. Today it is considered a country free of corruption. It is this effective anti corruption methodology adopted by the Independent Commission against Corruption of Hong Kong that had been the main factor behind the great development it had achieved today.The commission has been credited with transforming Hong Kong and paving the way for the economic boom of the 1980s and 1990s, which helped Hong Kong city to become a corruption free and thriving international financial hub. Sri Lanka, too, can emulate the Hong Kong experience in eradicating the threat of corruption. So much so, the Independent Commission against Corruption of Hong Kong has expressed its willingness to provide necessary advice and guidance for Sri Lanka to establish an institutional system to control corruption.